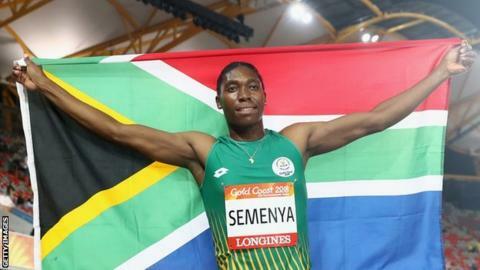 Olympic 800m champion Caster Semenya says Lord Coe's claim that "gender classification" is needed to protect women's sport has "opened old wounds". Coe is president of athletics' world governing body, the International Association of Athletics Federations. Semenya, 28, is challenging the IAAF over its bid to restrict levels of testosterone in female runners. The United Nations Human Rights Council called the plans "unnecessary, humiliating and harmful". Coe, who won two Olympic titles at 1500m and has been head of the IAAF since 2015, told Australia's Daily Telegraph last weekend: "The reason we have gender classification is because if you didn't then no woman would ever win another title or another medal or break another record in our sport." In a statement from her lawyers South Africa's Semenya, who took gold at the London 2012 and Rio 2016 Olympics said: "The scars Ms Semenya has developed over the past decade run deep. "Reading the comments of Mr Coe this weekend opened those old wounds and the reference by the Daily Telegraph (Australia) to 'the muscle-packed Semenya' is just the latest illustration of how the issues have been distorted by innuendo. "Mr Coe is wrong to think Ms Semenya is a threat to women's sport." Semenya also stressed her case was different from transgender athletes who were formerly male but have now entered the female sporting arena. "Ms Semenya is a woman. There is no debate or question about this and the IAAF does not dispute this," the statement added. "Mr Coe may have views about transgender women in sport, but that is a different issue.